Daniusoft Video to iPod Converter is an all-in-one and fast video to iPod Movie Converter software which can converter Video to iPod Video MP4 including AVI, MP4, MPEG, WMV, XviD, H.264, DAT, MOV, ASF and FLV, etc. to iPod MP4, MPEG-4, M4V and rip video audio to iPod MP3, M4A, AAC. 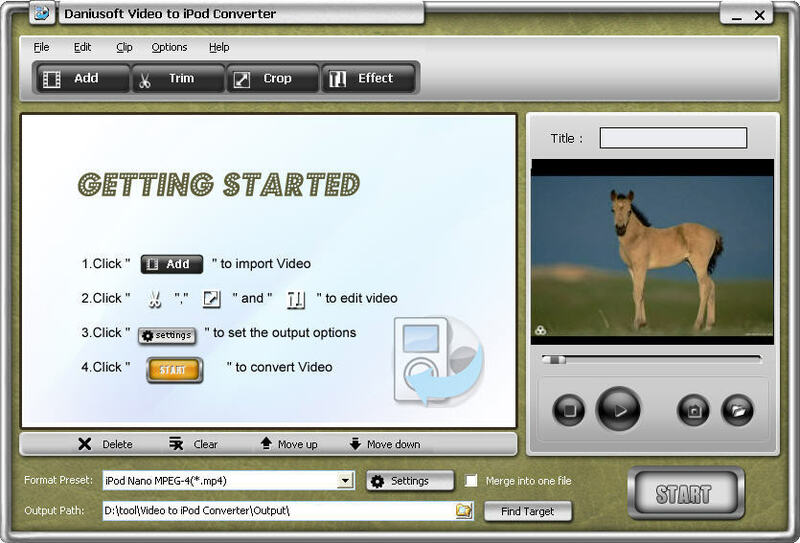 This multifunctional Video Converter for iPod allows you to set many video editing functions: video crop, movie trimming, and video effect adjustment. You can also set encoding parameters (including solution, bit rate, frame rate, brightness, saturation, and aspect ratio) to get the best video quality. With this powerful iPod Movie Converter, you can enjoy any videos on your iPod anywhere and anytime. This iPod Video Converter Software is so easy-to-use that whether you are an experienced user or a beginner, converting all popular video formats to iPod such as: Convert WMV to iPod M4V video is just a breeze. Just free download it to have a try! This multifunctional Video Converter for iPod allows you to set many video editing functions: video crop, movie trimming, and video effect adjustment. You can also set encoding parameters (including solution, bit rate, frame rate, brightness, saturation, and aspect ratio) to get the best video quality. With this powerful iPod Movie Converter, you can enjoy any videos on your iPod anywhere and anytime. This iPod Video Converter Software is so easy-to-use that whether you are an experienced user or a beginner, converting all popular video formats to iPod such as: Convert WMV to iPod M4V video is just a breeze.